Business continuity in financial services has evolved significantly over the last several years. But many institutions have failed to keep up. “The terrorist attacks resulted in a wide-scale disaster in our most highly concentrated financial services area. Market based and geographic concentrations significantly exacerbated disruptions. Because of critical interdependencies, problems at key New York City infrastructure providers disrupted operations at distant institutions. The attack ushered in a new focus on business continuity in financial services. Financial institutions and government agencies worked aggressively to implement new safeguards. Revamped disaster recovery plans were introduced to protect the markets, as well as individual firms and their participants. That was 15 years ago. Virtually a lifetime in the tech world. New technologies have since completely changed how we think about disaster recovery. Yet many businesses are using outdated solutions that leave their data at risk. Disasters don’t have to be on the scale of September 11 to wreak havoc on a financial services organization. Fire, flooding, cyberattacks and ransomware are just a few of many possible threats. Each one has the power to disrupt access to your data and corrupt it. Downtime is simply not an option. Outdated backup technologies require hours, days or even weeks to fully restore lost data. The longer it takes to restore that data, the more it impacts the business. Today’s best business continuity service providers enable you to restore that data almost instantly with newer, more resilient backup solutions like Datto. These solutions can utilize both local and cloud-based backups for the fastest possible recovery. A daily backup verification process also tests the integrity of that data to ensure it can be successfully restored. No financial services company can afford to “lose” customer data after a disaster. Nor can it let its own sensitive company data – files, emails, databases and so on – fall into the wrong hands. This is why superior data encryption and recovery must be an integral part of business continuity in financial services. Whether you’re backing up data locally, in the cloud, or both, it must be secure. This ensures that highly sensitive data is not made vulnerable during transit or as the result of a system failure. Financial services businesses must think beyond the old concept of merely restoring operations after a disaster. Today’s best business continuity companies provide advanced technologies that ensure you can maintain your operations. In other words: by recovering data almost instantly, you reduce the downtime and disruption to virtually zero. 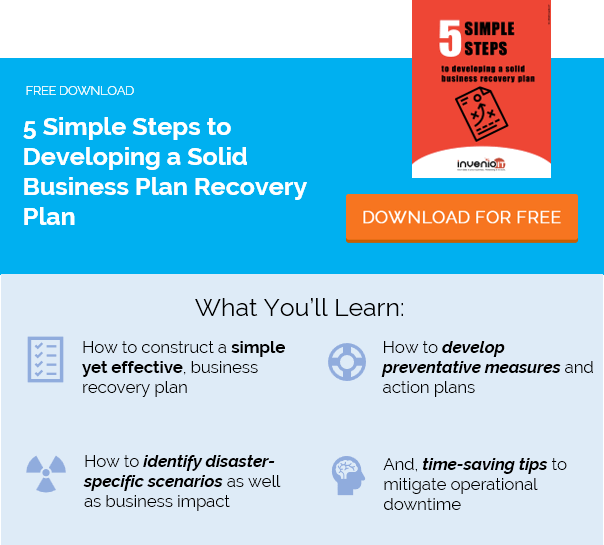 A rapid recovery ensures the business can continue to operate, minimizing the risks of financial losses after a disaster. Due to the unique interdependencies within the financial services industry, a disruption at a single firm can have far-ranging consequences. This is why any amount of downtime must be prevented, especially after a disaster. A failure to rapidly restore data can be devastating not just on the business alone, but also on the markets in which they operate.